Small businesses still need big business tools. The days of the Microsof t Office individual license have passed. Microsoft 365 can help you get your business the tools it needs. Having more than one location for your data backup, whether down the street or across the country, can help your company in times of crisis. Find out more about our Colocation Services today. One of the most common manager complaints is that their team stops functioning when e-mail stops functioning. Let us help you with dependable hosted exchange. Forward Slash Technology offers cloud computing services to our clients. 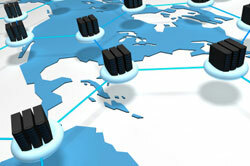 Essentially, cloud computing is relocating in-house programs to the cloud (or the internet). Cloud computing can help you save money that can be reinvested elsewhere in your organization by saving you money on servers, programs, maintenance staff and training. Some of the most common cloud computing resources are hosted Exchange (cloud-based e-mail), data backups and spam filtering software. Forward Slash Technology is a St. Louis cloud computing provider offering cloud computing services to small and mid-sized businesses. Cloud computing services are a cost effective way for businesses to access the network services they need to run their business. When working with a cloud computing provider, you pay for only the services and resources that you use. Cloud computing services are flexible because they allow businesses to add services as needed and shrink or expand the resources used to fit their requirements. To learn more about the cloud computing services that are available from our IT company as a leading cloud computing provider, please contact us today. 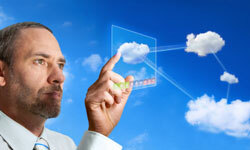 Cloud computing is a new way of thinking about IT infrastructure. With cloud computing services, businesses have the ability to increase capacity and add capabilities to their network without investing in new infrastructure, training new personnel, or licensing new software. When utilizing cloud services from a cloud computing provider, businesses can access a shared pool of network resources including networks, servers, storage, applications, and services. These services can be accessed from any desktop, laptop, mobile device, or tablet. With cloud computing services, cloud computing providers manage the systems and take the complications of hosting and maintaining a server away from businesses. When using services from cloud computing providers, business can even store files and data on the cloud and rest assured that this data is secured. In addition to acting as a cloud computing provider, Forward Slash Technology can also provide support services if your organization is utilizing cloud computing services from other third party cloud computing providers. To learn more about how our cloud computing services can meet your business' needs, contact Forward Slash Technology today. We are a St. Louis IT company serving all of St. Louis, St. Charles, Chesterfield, Arnold and Affton. We are available Monday through Friday, 7 a.m. to 6 p.m. to answer any question you have about cloud computing, network security or managed services. Hosted Exchange Server Services: We are a hosted exchange service provider offering exchange hosting services to businesses throughout the St. Louis area and around the entire country. We can host and manage exchange systems and offer cloud bases exchange hosting in order to allow you to focus on business rather than worrying about a number of time consuming IT tasks. Colocation Services & Cloud Hosting: Colocation services and cloud hosting services are two main services that help alleviate the troubles and expenses businesses can have when hosting websites or managing multiple servers. IT Disaster Recovery Plan & Off-Site Backup Services: Most companies do not think about a backup or recovery plan until disaster strikes. At Forward Slash Technology, our IT disaster recovery plan and off-site backup services can help you prepare for, prevent, and manage a potential loss of information. To learn more about these or any of the services available from our IT company and cloud computing provider, please contact our IT company.